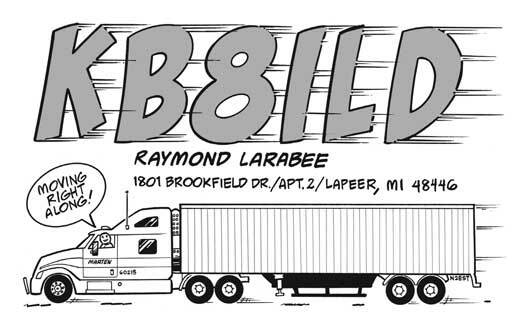 Raymond, KB8ILD, is a long-haul trucker who wanted his semi — not just any semi, but his semi — on his QSL card. Easy, right? Well, sort of. While there were plenty of reference images on the Internet to help me get the the general dimensions correct (and he did send me a picture of his truck), a rig like this doesn’t easily fit onto a postcard. To balance it out, I moved the call sign above the trailer rather than placing it on the trailer itself. I also hand-lettered the entire card, something I do from time to time. I worked for years hand-lettering comic books for Marvel, Dark Horse, First and other publishers, so I’ve had plenty of practice. This entry was posted in cartoon QSLs and tagged amateur radio, big rig, cartoon QSL, ham radio, ham radio cartoon, ham radio humor, Hamtoons, KB8ILD, mobile operation, N2EST, QSL, trucker. Bookmark the permalink.